If you've recently acquired a French press coffee maker or are thinking of getting one, you might be wondering why these little coffee presses are all the rage these days. 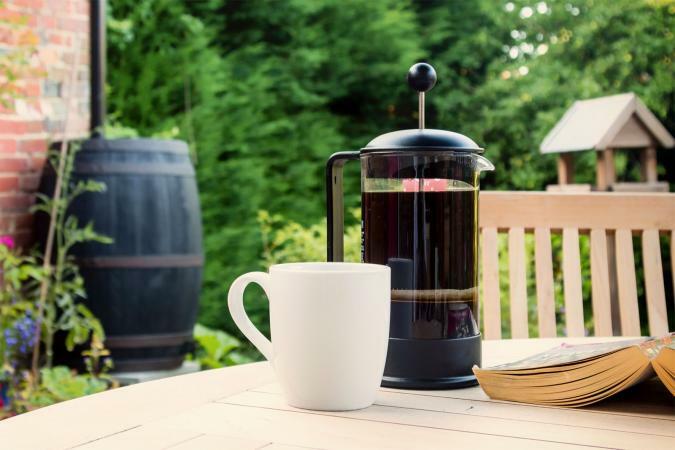 While there are many different ways to make a cup of coffee, many will agree that the French press is the perfect ratio between ease and quality. For those not in the know, here's a bit of information to bring you up to speed. A French press is a filterless contraption that brews coffee and then allows you to separate the grounds from the coffee by pushing them down to bottom of the carafe with a metal plunger. It's a very simple process that yields a great cup of coffee without very much effort on your part. Also known as a press pot, coffee press, coffee plunger or cafetière, a French press is a cheap alternative to expensive electronic coffee makers. While a decent coffee machine might cost you $50 or more, a French press will only run you around $15 (unless you seek out a fancy, expensive model, that is). On top of being cheap, French presses are also versatile and notoriously easy to use. You can use your French press to make tea, hot cocoa, yerba mate or any other sort of brewed drink without getting any grounds or leaves in your finished product. French presses also give you a superior cup of coffee. When you make coffee in a French press, you initially throw all of the coffee and water into the same chamber. Since they're completely mixed together in an area where they can mingle freely, more of the coffee's surface area is exposed to water, meaning that the water is free to absorb more of the coffee's natural flavors and essential compounds. This makes for more flavorful, full-bodied coffee. Coffee from a French press is usually stronger and thicker than that made from a traditional drip-maker, and since it's captured more of the coffee's volatile oils than a regular coffee maker can, French press coffee can turn bitter if not drank immediately. A good cup of French press coffee will begin to deteriorate after about 15 minutes, and at 20 minutes it may be quite bitter. Using a French press coffee maker is super simple. First, you want to have the proper grind for your beans. Since a French press uses a metal screen to filter coffee, you need to make sure your grind is coarse enough to not slip through the openings of the screen, using a coarser grind than you would for drip coffee, which will be too fine to work well in a French press. Whether you use organic green coffee, Italian blends or other estate coffees, it's fairly easy to learn how to make French press coffee. Experts recommend using filtered water to remove potential impurities. Impurities diminish the taste and can add off, metallic flavors to coffee. Another tip to make a great cup of coffee with a French press, is to grind the beans at home. Recently ground coffee beans add a freshness to any cup of coffee but are particularly good for French press coffee. You can more easily control the particle size of the coffee, and it will enhance the flavor even more. Wash out new French press coffee makers before using. Now that you have the ingredients assembled, heat water to about 190 to 200 degrees. That's just below boiling. Use two level tablespoons of coffee for each six ounces of water added to the French press. Place the coffee in the press according to the directions that came with the press. Add hot water and let stand for two to four minutes. Then gently depress the plunger, pushing the grinds down to the bottom of the press. Pour out the coffee and enjoy! Be sure to clean the press afterwards. There are some common problems neophytes have in learning how to make French press coffee. Bitter coffee: You may not be used to the stronger flavor, or the coffee blend itself may not be to your liking. Try another blend. Too strong coffee: French press coffee is likely to taste stronger to you than any other type. It may take some getting used to. If you've given it a try for a few days but still feel the coffee is too strong, shorten the brewing time or use less coffee grounds. 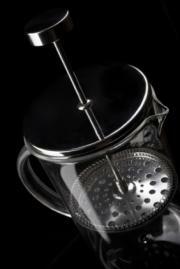 Grinds in the liquid: Some minor particles do escape the mesh screen at the bottom of the French press. If you feel like you're drinking mud sludge, however, check the grind setting on your coffee bean grinder. Your particle size may be too small. Go for coarse grinds to ensure that the particles are trapped in the little screen. Coffee Geek has a wonderful page about the French press, including a full photo tutorial on how to load it up and make a great cup of coffee. Having trouble with your French press? Try this troubleshooting guide. How does French press coffee stack up again espresso?